In the recent State of the Academic Health Center address, Dr. Frank Cerra, Senior Vice President for Health Sciences, referenced a 1970 report by the External Committee on Governance of the Health Sciences to then University President Malcolm Moos. 1. Is there a need for a Regents’ definition of the missions and responsibilities of the health sciences? 2. Given the history, current situation, existing competence and needs of the health sciences, both within and without the University of Minnesota, what alternative administrative structures could be developed for units in this area? Such administrative structures should also take cognizance of the needs of the allied health professions. 3. How should the responsibilities for continuing and graduate education in the health sciences be divided between the health science units, the Extension Division, and the Graduate School? 4. What steps should be taken to assure satisfactory relationships between all professional units in the health sciences and the hospitals? 5. What steps should be taken to assure satisfactory relationships between all professional units and the basic science departments? 6. What should be the pattern of relationship sought with affiliated hospitals, and other community agencies and services and the locus of decision making on contracts specifying these relationships? The report outlines the committee’s suggestions on the mission, administrative structure, and relationships to basic sciences, allied health, the University Hospital and affiliations, and the Graduate School. As an audience member at the State of the AHC noted, the report called for the establishment of a School of Allied Health Sciences, an achievement now taking form. 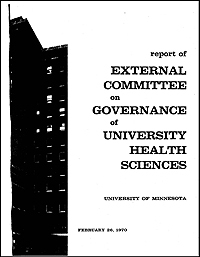 The groundwork for the report came from a campus visit in January 1970 as well as two supporting documents: Discussion Papers for External Committee on Governance of the Health Sciences and Background Information for External Committee on Governance of the Health Sciences. Read the final February 26, 1970 report in full below.